Why is interest on loans going up when RBI has held rates? Housing Development Finance Corp. Ltd, one of the largest lenders in India for housing loans, recently raised its lending rates by up to 20 basis points. In the past few months, leading banks, including State Bank of India (SBI), Punjab National Bank and ICICI Bank Ltd, also increased their marginal cost of funds-based lending rate (MCLR) by 10-20 basis points. A basis point is one-hundredth of a percentage point. 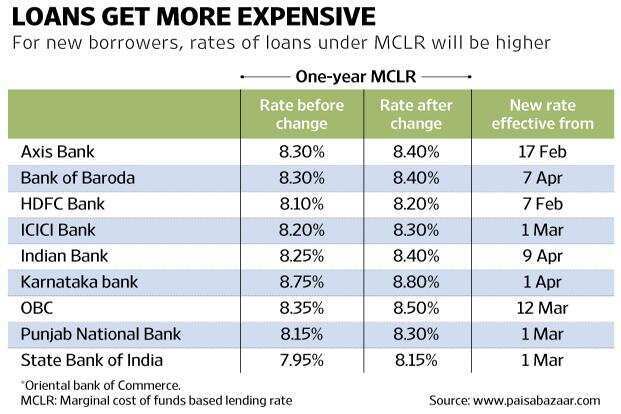 This means that rates for all new borrowers for home, personal or car loans under MCLR would be higher than the rates prevalent a few months ago. For existing borrowers, the rates will get revised in the next reset cycle based on whether the loan is linked with 1-year or 6-month MCLR. But why have loan rates gradually gone up, even though the Reserve Bank of India has not raised interest rates? Loan rates go up when the cost of funds for banks goes up. Simply put, to give loans to borrowers, banks need to gather deposits from customers. The interest given out to depositors determines the cost of funds for the banks. A deposit in a bank is a borrowing for the bank as it pays interest on it. In the past few months, larger banks like SBI have increased deposit rates, for bulk as well as retail depositors. The rise in cost of funds gets translated into rise in interest rates. Moreover, stress in the banking sector in the form of non-performing assets (NPAs) too has had an impact, even if an indirect one. An NPA is a loan (an asset) that stops generating income. Banks have to make provisions for the losses likely to arise out of NPAs. This impacts their profit, and to prevent losses, banks keep interest rates on loans at a higher level.